All people deserve the opportunity to live healthy, rewarding lives. No American should have their potential limited, have their life cut short, or be deprived of their fullest measure of happiness because they do not have the mental health support they need. On World Suicide Prevention Day, we reaffirm our belief that mental health is an essential part of overall health, and together, we renew our commitment to supporting and empowering all Americans to seek the care they need. Suicide is often related to serious depression, substance use disorders, and other mental health conditions. That is why recognizing severe psychological distress and ensuring access to the care and services needed to diagnose and treat mental illness are crucial to our efforts to prevent suicide. Individuals can also experience emotional and mental health crises in response to a wide range of situations -- from difficulties in personal relationships to the loss of a job to bullying at school. And for some of our Nation's veterans and military service members, these challenges are compounded by the invisible wounds of war. Tragically, these crises can sometimes involve thoughts of suicide -- and we must do more to support those suffering. 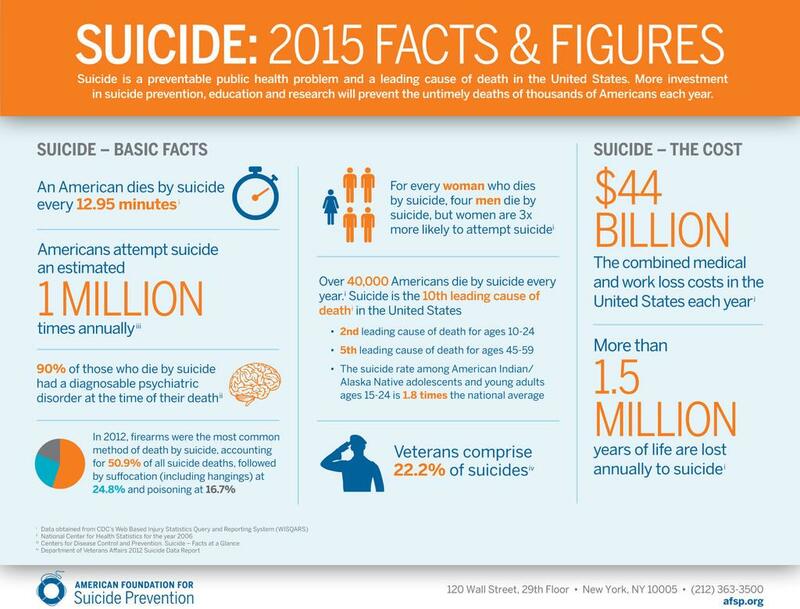 All Americans can take part in promoting mental well-being and preventing suicide. Everyone can contribute to a culture where individuals are supported and accepted for who they are -- no matter what they look like, who they love, or what challenges they face -- and where it is okay to ask for help. We can do more to recognize the signs of mental health issues early and encourage those in need to reach out for support. And we must remind our loved ones that seeking treatment is not a sign of weakness; it is a sign of strength. If you or someone you know is in need of help, the National Suicide Prevention Lifeline offers immediate assistance for all Americans at 1-800-273-TALK. Veterans, service members, and their loved ones can call this number to reach the Veterans Crisis Line, and they can also send a text message to 838255. The Affordable Care Act extends mental health and substance use disorder benefits and parity protections to over 60 million Americans, helping men and women across our country access critical care. Protections under the health care law prohibit insurers from denying coverage because of pre-existing conditions, like a diagnosis of mental illness, and require most insurance plans to cover recommended preventive services without copays, including behavioral assessments for children and depression screenings. In February, I was proud to sign the Clay Hunt Suicide Prevention for American Veterans Act to help fill serious gaps in serving veterans with post-traumatic stress and other illnesses. This law builds upon our ongoing efforts to end the tragedy of suicide among our troops and veterans. Last year, I announced 19 Executive actions to make it easier for service members and veterans to access the care they need when they need it, and our Government has focused additional resources on mental health services, including increasing the number of mental health providers at the Department of Veterans Affairs. My Administration is also committed to doing all we can to empower those facing challenges and hardship. We are dedicated to combating bullying, harassment, and discrimination in our schools and communities. We are doing more to guarantee all veterans and members of our Armed Forces -- as well as their families -- get the help they deserve while they are serving our Nation, as they transition to civilian life, and long after they have returned home. And across the Federal Government, we are working to ensure all Americans are supported in times of crisis. Suicide prevention is the responsibility of all people. One small act -- the decision to reach out to your neighbor, offer support to a friend, or encourage a veteran in need to seek help -- can make a difference. It can help energize a national conversation and a changing attitude across America. If you are hurting, know this: You are not forgotten. You are never alone. Your country is here for you, and help is available. As we pause to raise awareness of the importance of suicide prevention, let us remember all those we have lost and the loved ones they left behind. As one people, we stand with all who struggle with mental illness, and we continue our work to prevent this heartbreak in our communities. NOW, THEREFORE, I, BARACK OBAMA, President of the United States of America, by virtue of the authority vested in me by the Constitution and the laws of the United States, do hereby proclaim September 10, 2015, as World Suicide Prevention Day. I call upon citizens, government agencies, organizations, health care providers, and research institutions to raise awareness of the mental health resources and support services available in their communities and encourage all those in need to seek the care and treatment necessary for a long and healthy life. IN WITNESS WHEREOF, I have hereunto set my hand this ninth day of September, in the year of our Lord two thousand fifteen, and of the Independence of the United States of America the two hundred and fortieth. Next week’s podcast (2015/09/15) features Dr. Julie Goldstein Grumet, Director of Prevention and Practice at the Suicide Prevention Resource Center. Established in 2002, SPRC.org is the nation’s only federally supported resource center devoted to enhancing the national strategy for suicide prevention.